BLOOMINGTON – Indiana brought the same energy Thursday as it had in its upset of then-No. 6 Michigan State on Saturday, but the Hoosiers were unable to pull off a second straight top 20 victory. Jordan Bohannon scored a season-high 25 points, including two devastating late 3-pointers, and Tyler Cook added 21 points and seven rebounds to lead No. 20 Iowa to a 77-72 win at Assembly Hall in front of an announced crowd of 17,222. 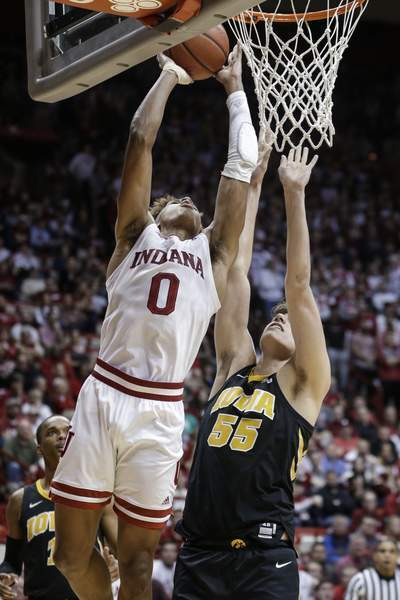 Romeo Langford led Indiana (13-10, 4-8 Big Ten) with 22 points, including 15 in the second half, his second 20-point performance in three games. Juwan Morgan added 17 points. It was Indiana’s eighth loss in nine games and its third straight defeat at Assembly Hall. Indiana played well enough to win, but the Hawkeyes simply made too many big shots at key moments. "I wasn't terribly disappointed in our team tonight," coach Archie Miller said. "I thought we were really together again offensively, whether it was (against) the man or the zone. We continued to be able to get 17 assists in the game, which is something we've got to keep doing and we shot a good percentage, as well. "Give (Iowa) credit. They are really hard to guard and it showed tonight." The Hawkeyes (18-5, 7-5) led by a semi-comfortable margin for most of the second half, but Indiana closed the gap down the stretch. A 7-1 run kicked off by a deep Devonte Green 3-pointer sliced what had been a nine-point Hawkeyes advantage down to three at 64-61 with 3:47 left. The final minutes were tightly fought and although Morgan provided one of the highlights of the night with a huge one-handed put-back dunk, Bohannon’s two 3-pointers in the final 90 seconds were enough to stave off the comeback attempt. Late in the game, the veteran leadership from juniors Cook and Bohannon helped Iowa hold off the hard-charging Hoosiers. "Two veterans in a tight game can bring that stability," Morgan said of the two Hawkeyes. "Older groups that have been there, especially with two guys like that one, one guy is a lot, but two guys is rare to come by nowadays. Just having those two presences out there, it's a security blanket." The game was played at a breakneck pace, with Indiana trying to push the ball off of every miss. It was reminiscent of some of the Hoosiers’ victories earlier in the season, when a good portion of their points came off the fast break. Several times, Miller yelled at his players to get up the court as fast as possible while the ball was in play. The quicker pace gave the Hoosiers some easy baskets, especially during an early 13-2 run that featured some of Indiana’s best offensive play in weeks. The Hoosiers had two layups and two dunks during the run and jumped out to 15-11 lead as Assembly Hall roared. The rest of the game was more of a mixed bag on the break, however. Indiana sometimes played a little bit too fast, making ill-advised passes in transition or driving into a crowd and missing. Indiana had 12 turnovers and Iowa took advantage, scoring 19 points off those miscues. "Just us not taking care of the ball," Langford said of the turnovers. "They weren't really pressuring us as much as it seemed like, we were just being lackadaisical in the first half (when Indiana turned it over eight times). ... That's how we got in the hole we did." Iowa took control of the game with a huge 15-2 run midway through the opening half that capitalized on a run of Indiana turnovers and missed defensive rotations. The Hawkeyes hit three 3-pointers during the run, including a pair from Joe Wieskamp, who went 4 of 6 from beyond the arc and had 13 points. The run left the Hawkeyes in front 31-20 and although Indiana responded with a 9-0 spurt that included two flying Justin Smith dunks, Iowa extended its lead back to 46-36 at halftime behind two more 3-pointers from Bohannon. Iowa capitalized on Indiana’s need to often double-team Cook inside and hit 10 3-pointers, nine from Bohannon and Wieskamp. Bohannon added six assists. Indiana's defense was actually solid for the most part, but Iowa had a knack for scoring back-breaking baskets at the end of the shot clock after the Hoosiers had guarded well for 20-25 seconds. Solid defensive possessions for Indiana several times ended in three points for Iowa. "I saw three or four balls deflected on the pass that land in play and (Iowa) gets it," Miller said. "There was a few that were raked out of the paint and it was on the ground and (Iowa) gets it. You have to find a way to get those balls to win this type of a game. We were never able to get it even and then play with a lead. We were always constantly clawing." Center De'Ron Davis played his second straight stellar game after missing three straight with an ankle injury. The 6-foot-9 Davis gave Indiana valuable minutes after Morgan picked up his fourth foul with almost 17 minutes to play. Although he only scored four points, Davis had seven assists and showed his feel for finding the open man from the post or from the middle of the zone. He did not turn the ball over. Ultimately, the Hoosiers fell short against a good team, but Miller sees reasons to be optimistic. "(This game) is going to be evaluated just like Michigan State," the coach said. "Are we in check with our attitude? Did we come together? Did we play hard, and did we play unselfish? I think we did a lot of those things."